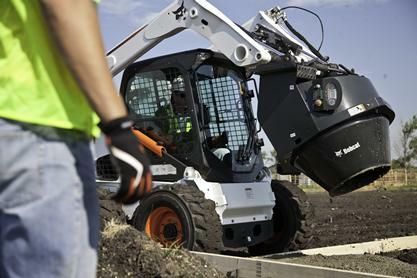 The Bobcat concrete mixer attachment lets you mix, transport and dump concrete much more quickly than a traditional stand-alone mixer and wheelbarrow. The attachment's compact size makes it perfect for sidewalks, driveways, finish work, fence posts and footings and floors of small buildings. It's great for working in hard-to-reach or limited-access areas.